Any working professional, after some experience in corporate world would like to boost his career prospects. An MBA degree clearly comes to mind, when we think of mid career promotions or better job prospects. A question which is commonly faced by such MBA aspirants is whether to go for Regular MBA or opt for Executive MBA. In this article we want to make things clear about which course suits for which type of MBA Aspirant and what’s the difference between two. 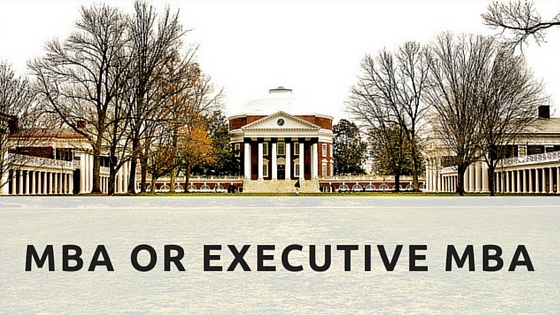 Executive MBA is wrongly considered as a superior MBA. It remains the fact that both are- Masters of Business Administration, and difference lies in the delivery of course and profile of students attending the course. Does Age and Experience Matter? Whether a student should opt for Regular MBA or Executive MBA entirely depends upon his current job role and situations. Executive MBA students/aspirants are considered relatively older with greater industry exposure and work experience while regular MBA is ideal for students with limited job experience. Also, Regular MBA aspirants are usually students looking for immediate job change while Executive MBA are ideal for aspirants who want to continue in same industry, but accelerate their career growth. For an Executive MBA course, b schools look for working professionals with significant corporate experience above 10 years. While selecting students for EMBA, college looks for professional background, contribution made to the employer and leadership quality. It is assumed students would know basics of business management, as they have worked for many years, so only domain knowledge is taught and examined. They are selected by CAT/XAT/GMAT score and personal interview based on their work. However, Regular MBA attracts students with limited work experience about 2-5 years and is looking for accelerated career growth. They are taught basics of business and general management to expose them to corporate world and internship is also needed. They are selected by Written Tests, Group Discussions and Personal Interview based on basics of business, current business news and work experience. MBA as a whole has a challenging life style- managing so many things and keeping pace with time. Executive MBA seems to be having more challenging life style than Regular MBA. An Executive MBA student is also a professional. So, he lives two lives- one as a student, another as an employee of company. He manages his responsibilities set by company and ensures good performance. At, the same time, he has to deal with academics of Executive MBA, assignments, tests, presentations, group tasks and most important examinations. A Regular MBA student has to devote time for class room study, club activities, seminars/workshops, assignments, contests, placements and extra activities (sports/cultural). As I mentioned in starting, MBA or Executive MBA, both have same destination, though the process is entirely different. Previous Post: CFA vs MBA – which one should you pursue? MBA vs. CA - which is the right choice? Copyright © 2019 TargetAdmission. Powered by WordPress and Stargazer.